September 7th in Theme Lists, WordPress Themes by Wordpress Jedi . So you are passionate about taking care of injured animals? Maybe you would like to sell your own pet foods. Whatever the case, you will need to have a professional website for your business. 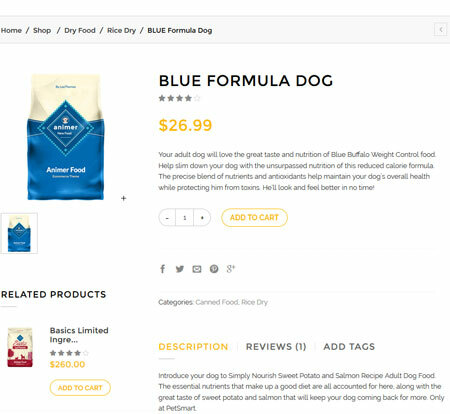 Animer is an AJAX WooCommerce theme that lets you sell your own pet products online and maintain a side-blog. Animer comes with an AJAXified shop pages with filtering, infinite scrolling, and other dynamic features. You get 2 different headers and 2 homepage layouts. The theme is responsive and adapts to mobile devices. Thanks to Options framework, you can change your logo and other settings. Animer comes with lazy loading for thumbnails, product wishlist integration, and Visual Composer for drag & drop layout customization. This is a commercial theme by an Elite Author.